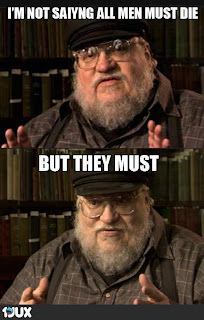 There are many competing theories about how A Song of Ice and Fire is going to end. I expect the most popular is the one about Jon Snow actually being the son of Stark and Rhaegar Targaryen, making him the third head of the dragon, as well as the 'ice' part of 'A Song of Ice and Fire'. Sounds likely. But, I've uncovered the truth. In the end, Victarion ('victory') will win the day for the Ironborn, taking Daenerys as his wife and ruling both Westeros and Essos, smashing Stark, Lannister, Baratheon, and Martell alike. Why? All to fulfill GRRM's quashed life-goal of being a boat captain. You're wrong. Bran permanently wargs into Hodor and hulk smashes everyone. Then he jumps on a dragons back and flies around the world with metal guitars wailing in the back ground.